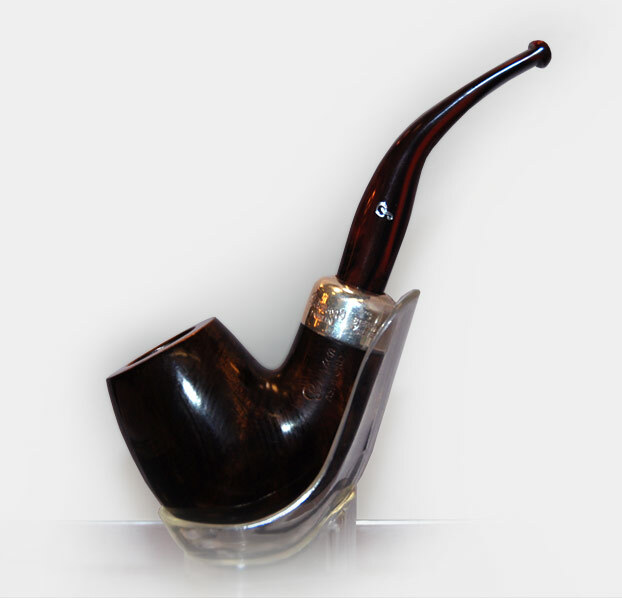 Peterson Ashford Briar Pipe - Sterling Silver Shape XL90 | Old Morris Tobacconist Victoria BC, Fine Cigars, Humidores and Tobacco Merchantile. Pipes from Peterson’s Ashford collection are premium briar pipes named after the medieval Ashford Castle in Ireland. The bowl is a dark, rich brown with a smooth finish and an acrylic stem demarcated by a sterling silver mount. The XL90 is a variation on the classic bent Billiard. It has a wide shank and a wide bending stem with an easily dissembled mount design and a rich, extra-dark stain bowl with a fishtail mouthpiece.